Heat two tablespoons in hot water. Take a portion of the purée with a tablespoon. 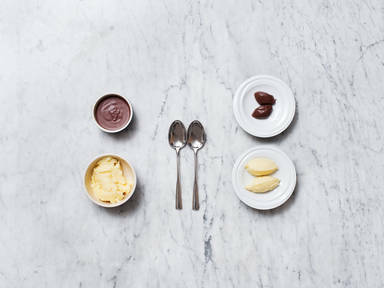 Using a second spoon, pass the mixture repeatedly between the spoons and serve quenelles. Heat a teaspoon in hot water. Scoop a quenelle out of the mousse. Enjoy!